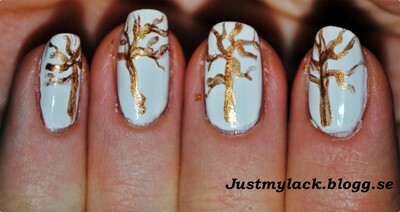 I'm having some camera problems right now, which means that I can't show you the updated version of my tree nails or any other nail art for that matter. But hopefully it will be solved by tomorrow! 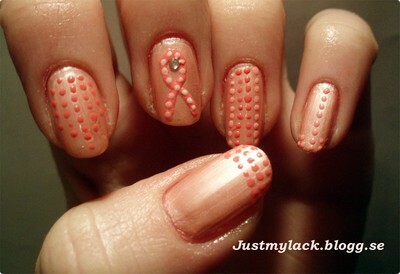 This is a very easy nail art I did yesterday. 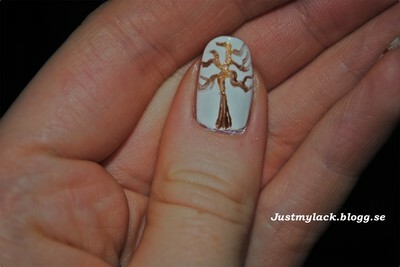 It is rather unusual for me to have the same design on all my nails but liked how it turned out. I felt that it was fitting since we had the first snow last week. I used Alix Avien 60 as a base, it has the best opacity I have seen in a white nail polish and for those of you that have the opportunity to get your hands on a bottle I highly recommend it. The trees are Gosh Iron and were painted with a fine art brush. I almost never wear pink nail polish, but today I wanted to do a pink manicure because October is breast cancer awareness month! I encourage everyone to buy a Pink Ribbon to give money to cancer research and it is so important to raise awareness and to tell women how they can examine themselves to increase the chance of discovering tumors early on, it can save lives! I used an old name and numberless Wet’n’Wild Polish as a base and for the dots and the Pink Ribbon I used different mixtures of Alix Avien 215 and Depend 01. 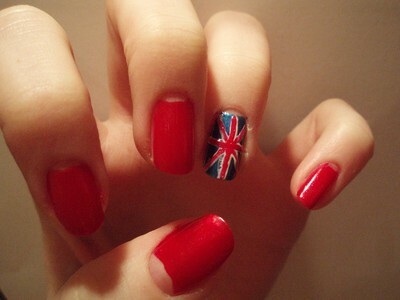 I am going on a holiday tomorrow and today’s nails are inspired by the destination: UK or more specifically London. I painted the Union Jack on my ring finger with Golden rose 53, N.Y.C 143A String of pearls and FlorMar true colors 017 and then I did a classic half moon manicure on the other nails. I won’t have access to a computer so unfortunately I won’t be able to interpret the last two bad guys In Putity’s Villain theme but I’ll be back on Sunday. Today it is time for madame Mim on Purity's Villain theme and this is a simple interpretation of her. 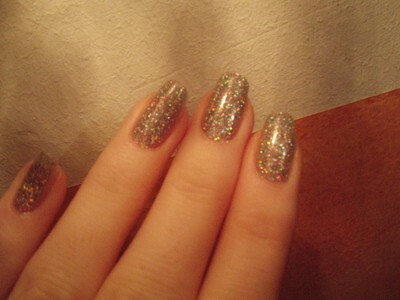 The base is a franken polish I have mixed and the sponging was done with Depend 115. 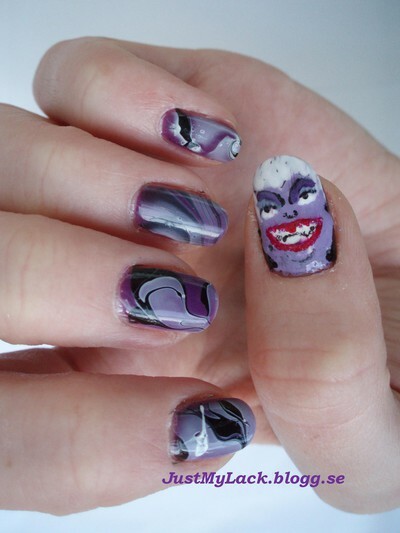 I wanted the sponging to have an edgy look, similar to madame Mim’s hair so I tried to stroke rather than dab the colour onto the nail. 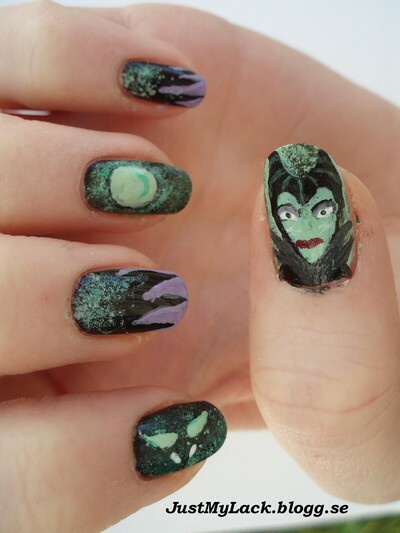 Today it is time for my favorite Villain from Purity’s Theme : Maleficent! She’s got grace and style and she is probably the most evil villain of them all. For the thumb I used Isadora vintage mint 619 as abase and Mavala Black 48 for maleficent, her mouth is Alix Avien 191 and her eyes are Alix Avien 60. 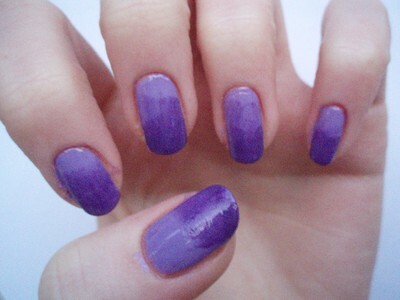 I Used mavala Black 48 as a base on all the other nails. On my pinkie and long finger I used Depend 115 mixed with Alix Avien for the purple cloak and the green fire is Isadora Vintage Mint 619. On my index finger and ring finger I used different mixes of Isadora Vintage mint 619,FlorMar Neon 007, Alix Avien 217 and 60. Today it’s time for the next bad guy in Purity’s lovely Disney Villain theme: Jafar from Aladdin! My inspiration was his turban and the scarab that he is searching for in the movie. For the Turbans I used FlorMar Supershine 40 as a base and the feathers are FlorMar 321 the gold is a Franken polish made from Gosh Iron and She Nail sugar 504. For the Scarab I also used Gosh Iron and She Nail sugar 504 and the base is FlorMar True Color 017. Sanna and Efwa at Purity are having a Disney villain theme and of course I just had to join in, I mean who doesn’t love Disney? Today’s villain is Ursula from the little Mermaid, and here is my interpretation. For Ursula’s face I used: Mavala 48 Black, Depend 115, Alix Avien 168 and 60, and FlorMar True color 017 for the lips. 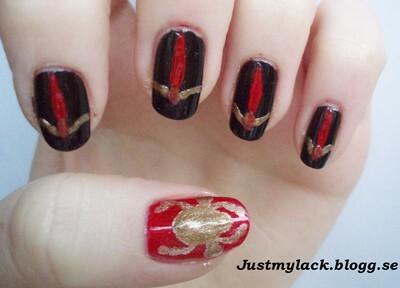 On the other fingers I had Alix Avien 168 as a base and did water marbling with mavala 48 Black and Alix Avien 60. I decided that 189 from Alix Avien deserves its own entry since it is so gorgeous but unfortunately this polish with holographic glitter is very hard to get a good photo that does it justice, but these are pretty accurate.